Can you identify this pupil from 1969? 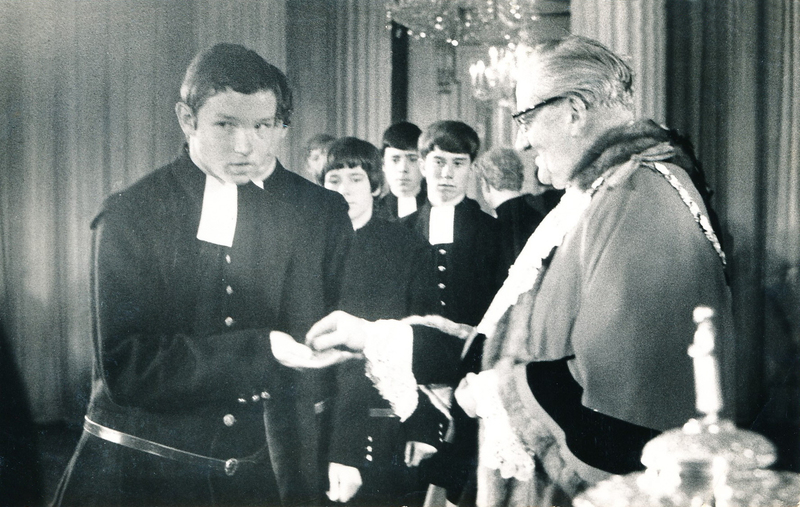 This photo was taken at the Mansion House in (I think) 1969 and shows Mike Trubridge receiving his shilling from the Lord Mayor (and trying to locate the Lord Mayor's wife, in front of whom all pupils had to bow). To his right is Chris Ennis, but who is the boy third from the left? Then to the right of the mystery person is Jeremy Usher-Smith. If you can identify the unknown pupil, or anyone else in this photo, please reply. it is possible that the boy almost totally obscured by Mike Trubridge is Dominic Gwynn, while there is an unknown Button Grecian with his back to the camera to the right of Jeremy Usher-Smith. Re: Can you identify this pupil from 1969? MikeT wrote: This photo was taken at the Mansion House in (I think) 1969 and shows Mike Trubridge receiving his shilling from the Lord Mayor (and trying to locate the Lord Mayor's wife, in front of whom all pupils had to bow). To his right is Chris Ennis, but who is the boy third from the left? Then to the right of the mystery person is Jeremy Usher-Smith. If you can identify the unknown pupil, or anyone else in this photo, please reply. it is possible that the boy almost totally obscured by Mike Trubridge is Dominic Gwynn, while there is an unknown Button Grecian with his back to the camera to the right of Jeremy Usher-Smith. A tentative suggestion is Howard (I think the H was Howard) Pearson. That's very interesting because I have a feeling that his name was Pearson, although I am not sure about this and I could certainly not remember his first name. So you may well be right, but it would be good if someone else could confirm this. Ooh it's like an Agatha Christie novel . Give us a clue, what house were they in as presumably we collected the shilling in our houses. Mike Trubridge is Mid A, or so he posts. Chris Ennis used to be in Mid B, (I played Chess with him in the sicker in 1965 before I left) but people swapped houses a lot in the late 1960's. So my guess is Middleton. Don't know who the mystery chap is though. The Lord Mayor, incidentally, is Sir Charles Trinder, one of the least distinguished holders of the office -- he gets fewer google hits than I do. Actually Mike Trubridge is not Mid A as suggested by ColeridgeA40. I think ColeridgeA40 was looking at the second post in the thread, which is from Mid A 15, and getting confused. Just for the record, I was Peele A. This means that there are probably three different houses represented in this photo - both Dominic Gwyn and Jeremy Usher-Smith were Peele A, Chris Ennis was from Mid B, while Howard Pearson (if indeed it is him) could be from another house. This clearly confirms that we did not collect our shillings in houses, as suggested by dsmg. If they were in the band, then they would not have collected by houses. As the amount of largesse varied by status, there must have been some order of collection. I don't think there was someone whispering in the Lord Mayor's ear 'A guinea for this one, a half-crown for this one, a half-guinea for this one' etc. From the precisely two photos I've got of me about to collect money, I'm preceded and followed by people of like status, but not necessarily in the same house. Something's gone wrong with the drill. We were told 'Take with the left, shake with the right, bow to the Lady Mayoress'. A long time after the original post I know, but I think the Button Grecian could well have been John Churchill who was (I think) Senior Grecian at the time. Sadly Mike Trubridge, the originator of this thread, is shown as 'no longer with us' in the newsletter I received from Gina Skillings today. I'm shocked having met him again in 2012 at the 40 years on event. At that time he still looked fit enough to be eminently capable of giving a good account of himself as a wing three quarter just as he did for the 1st XV at school. I have found this ebook written by Mike which some may find of interest. Could it be that the photograph is reversed? Look at how the coat buttons up. Well done, Insp. Maigret ! !